In 1972 Cooper Hewitt received a bequest of textiles from New York City architect and artist Julian Clarence Levi (American, 1874-1971). 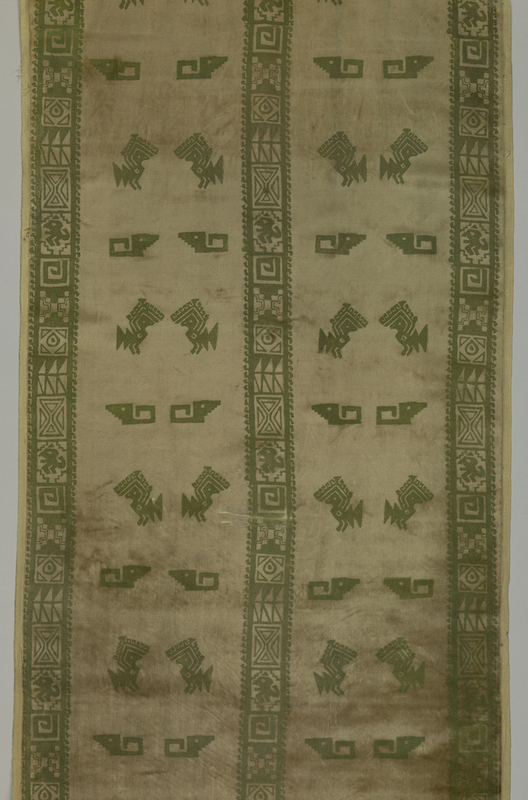 It mainly was comprised of French and Indonesian textiles, but also included two unusual velvet panels printed with pre-Columbian bird motifs and other forms. The design itself is rather simple and contains two vertical columns of confronted and addorsed birds within borders of geometric patterning. How Mr. Levi, a lifelong New Yorker with a passion for French culture, came to own these panels is unknown, and they presented an intriguing research opportunity. Scholarship in recent years has uncovered more information about a unique period in American design history when WWI effectively cut off the New York fashion industry from European design sources. This loss led to a collaboration between local museums, textile manufacturers and the fashion press that actively encouraged the development of a new aesthetic. The designs of the indigenous cultures of the Americas were the inspiration for new silhouettes and patterns, and New York museums with their vast holdings of this material were the perfect incubators for such an effort. Charles W. Mead, Peruvian Art: A Help for Students of Design, Guide leaflet, no. 46. New York: American Museum of Natural History, 1917, Page 8, Plate III, No. 7. While the project involved many individuals, it was M.D.C. Crawford who connected the realm of the museum to the business of fashion and design. His position as a research fellow at the American Museum of Natural History (AMNH) and journalist at Women’s Wear allowed him access to museum collections as well as a forum to write about emerging styles. Crawford’s colleagues also were engaged in the process, and AMNH curator Charles W. Mead in 1917 published Peruvian Art: A Help for Students of Design. This small publication took a selection of isolated motifs from pre-Columbian textiles and pottery vessels and rendered them as black and white line drawings to reveal their potential for pattern design. It was a great pleasure to discover that page eight of Mead’s book has the elaborately-crowned bird found on Cooper Hewitt’s printed velvet. Further research of Women’s Wear revealed that the second bird with a stepped beak was an accompanying illustration for Crawford’s article of August 28, 1916 entitled “Birds on Peruvian Ribbon.” While Crawford likely enlisted the services of several artists to help illustrate his design concepts for Women’s Wear, it was the textile designer Ruth Reeves who summed up her responsibilities as an illustrator for Fairchild Publications during this period: “Our job was to design full, or half-page, layouts of as faithful renderings of selected museum documents as was possible in black and white for line-cut newspaper reproduction. These were to be accompanied by research editorials by Mr. Crawford.”  Attributing this textile to Reeves is highly improbable given the design’s lack the sophistication, but it does seem likely that the panels are a product of AMNH’s design program. Flat stamps or cylinder stamps could have been used to apply pigment to the velvet, and the exercise certainly would have exposed students to the challenge of designing pattern repeats for textiles. M.D.C. Crawford, “Birds on Peruvian Ribbon,” Women’s Wear, August 28, 1916, page 17. Mead, Charles W. “Peruvian Art: A Help for Students of Design.” Guide leaflet, no. 46. New York: American Museum of Natural History, 1917. Crawford, Morris de Camp, “Birds of Peruvian Ribbon,” Women’s Wear, August 28, 1916, p. 17. Cited by Jeanne Klitgaard in “Ruth Reeves, American Textile Designer,” Thesis, University of Wisconsin–Madison, 1979, p. 12. An emerging textile artist, looks to find ways to select and or make a stamp from a subject -nature, animal, symbol-what medium works on a piece of fabric-design on paper-then the tough step-creating the textile on a chosen fabric-or weaving??? Embroideries,perhaps from Persia, perhaps from India, plus an embroidered robe, at least 100 years old, heirlooms from my husband’s missionary grandfather’s years in Persia, and his fathers ‘s years I India.